Fr. Clinton Sensat was born in Scott, Louisiana and graduated from Acadiana High School in 2000. Entering seminary after graduation, he attended St. Joseph's Seminary College, graduating in 2004. After a pastoral year during which he taught theology at Vermilion Catholic High, Fr. Sensat attended Mount St. Mary's Seminary in Emmitsburg, Maryland, graduating in 2009 with a Master's of Divinity and a Master's of Arts (Theology). Ordained to the holy priesthood on June 6, 2009, Fr. 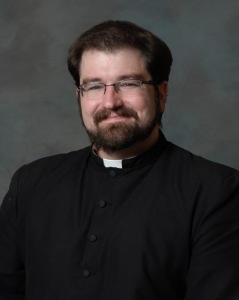 Sensat was assigned as the Associate Pastor of Sacred Heart and St. Joseph's parishes in Ville Platte, and as Chaplain to Sacred Heart School. In August of 2011, Fr. Sensat was sent by Bishop Jarrell for further theological studies to the Pontifical Faculty of the Immaculate Conception at the Dominican House of Studies in Washington, D.C. During that time he also worked as an assisting priest at St. Jerome's Catholic Church in Hyattsville, Maryland. On May 17, 2013, Fr. Sensat graduated with a Licentiate of Sacred Theology (S.T.L.) in Systematic Theology. A licentiate is a degree given by the Pope through a Pontifical University, granting the recipient a license to teach at any Catholic school throughout the world. Fr. Sensat is also a professor at the Aquinas Institute. He was assigned to St. Thomas More parish in 2013 and celebrated his first Mass here on July 15, 2013. In addition to serving as Pastor of St. Thomas More Church parish, Fr. Sensat serves as Chaplain of our Catholic Student Center located on the campus of LSU-Eunice.